Henry Newton, a Kansas merchant working in Boston, Massachusetts, is responding to the news of Quantrill's raid on Lawrence. Newton uses the event to try an elicit increased protection for the citizens and businessmen of Osawatomie, Kansas. In particular, Newton requests that a company of soldiers be sent to protect that area, and he mentions that Osawatomie will house said troops rent free. Newton also explains that troops are needed because he and other businessmen will not send any more goods to Kansas as long as they feel that there is a lack of sufficient protection for their merchandise. 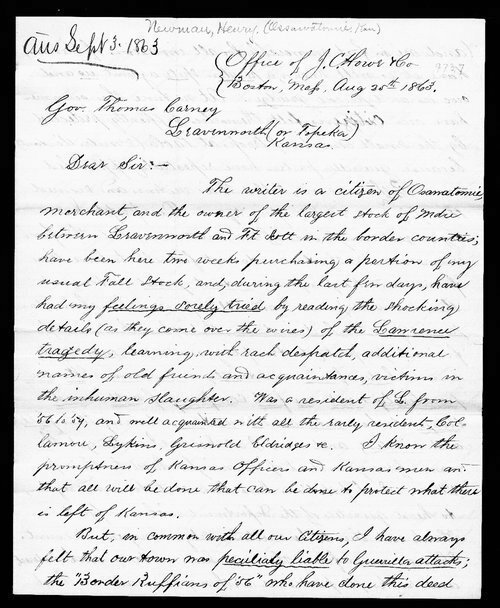 Newton's letter helps students understand the impact of Quantrill's raid on the rest of Kansas and, in fact, the entire nation. In addition, Newton's letter can be used when discussing guerilla raids into Kansas during the Civil War and the steps citizens took to defend themselves.